You can edit the text and other aspects of the email that is sent containing your client tasks. 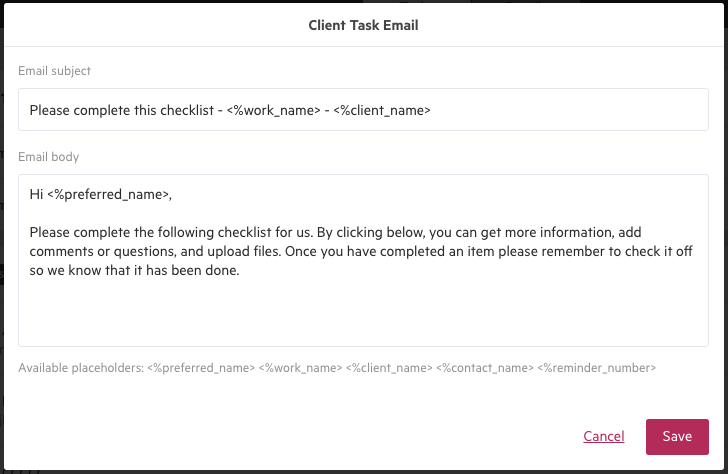 When you create a client task section and set the sending rules, your emails will include text outlining basic instructions for your client. You have the option to choose who the email will be sent from and what content is included in the body and subject of the email. 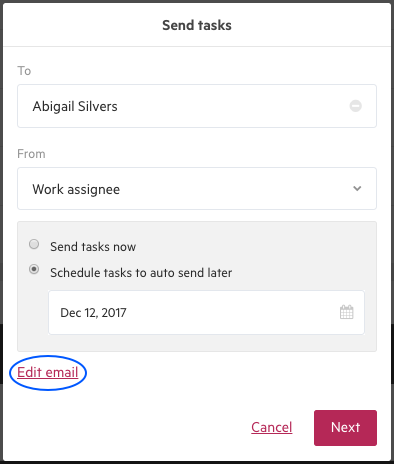 When you choose to send your tasks, you will be able to select who your task and reminder emails will be sent from—work assignee, client owner or another colleague. 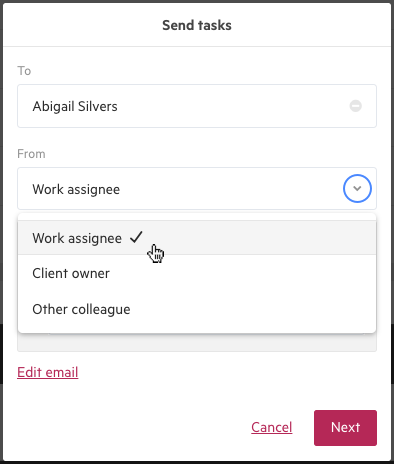 If you select client owner and there is not one, the sender will default back to work assignee. If the person you select has an email signature set up in Karbon, the signature will be added to all client task emails. You have the option to edit the email when you are choosing to send your client tasks. You will be able to customize the email body and email subject text for every client task you send. You will have the option to edit both the initial client task email, and your task reminder emails. Placeholder tokens are used to insert correct names and numbers into the client task and reminder emails. They are included by default in your client task emails—you'll see these when you choose to edit an email for the first time. These are optional to include and can be deleted. <%preferred_name> will update to the preferred name of the client the tasks are for. If the contact has no preferred name specified, the full name will be used instead. <%reminder_number> will update to the reminder number. This is the number of reminders that have been sent to the client for these tasks. Just like all tasks for repeating work, we copy client tasks to the work item ahead of it. So, if you update the client task email then it will be copied across to the next one in the series. More on work schedule rules here.